Lingual braces are an advanced and modern evolution in cosmetic dentistry. Hidden behind your teeth, they are not apparent and are therefore “invisible” when you smile. They eventually align teeth within the same amount of time required by conventional braces. Of course, each patient’s timeline depends upon their own specific case. Lingual braces are customized for each patient’s teeth, jaw size and shape with a computer-assisted technique. 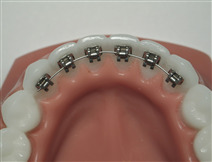 Lingual braces utilize the same wires and brackets normally used in traditional braces, and they are the ideal choice for athletes, models, actors, musicians and adult professionals. Again, it is essential to stress the importance of oral hygiene.